A modern metropolis of glassy skyscrapers, waterside boulevards, and lush residential neighborhoods, Perth sits on the edge of the Swan Coastal Plain. This jewel in the crown of Western Australia boasts a friendly, cosmopolitan atmosphere and a relaxed, easygoing way of life. As a result of its geographical remoteness and isolation, Perth has something of a self-contained feel. Perth is in Greater Perth. Use our Australia attractions planner to plan your trip to Perth and other destinations in Australia. 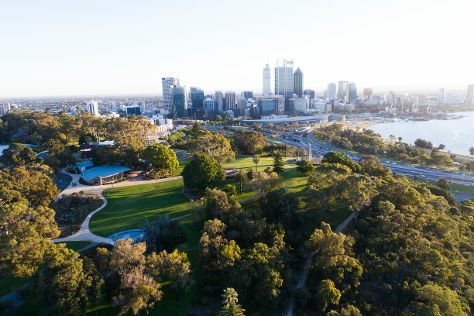 When you choose your Perth accommodations, remember that this city stretches over a wide area, which can cause issues for visitors with limited time to sightsee. The best way to remain close to urban transportation is to stay in the central business district or neighboring Northbridge, where you'll also find the greatest selection of hotels. To avoid the center's big crowds and steep hotel prices, consider booking a room in the coastal town of Mandurah, easily accessible by Perth's reliable suburban railway system.